PITTSBURGH – Two short-handed goals scored on the same penalty allowed the Pittsburgh Penguins break out of another early funk and ultimately pick up another win. Kris Letang and Phil Kessel scored in the shootout as the Pittsburgh Penguins fell behind early before holding off the Buffalo Sabres for a 5-4 victory Tuesday at Consol Energy Center. Letang and Kessel both made dekes before putting the puck on the ice to beat Sabres’ goaltender Chad Johnson. Penguins’ goaltender Matt Murray stopped Ryan O’Reilly and Jack Eichel helping Pittsburgh win for the ninth time in 10 games and move within a point of the second-place New York Rangers in the battle for home-ice advantage during the first round of the upcoming Stanley Cup playoffs. The Penguins can clinch their 10th straight playoff berth with a win Thursday against Nashville and a regulation loss by Detroit on Friday. Pittsburgh defeated Buffalo for the ninth straight time, its longest active streak against any opponent. This one didn’t come easy. Buffalo, 14th in the 16-team Eastern Conference, led 3-0 through one period, but the Penguins responded with a four-goal outburst in the second period to jump ahead. Ben Lovejoy scored his fourth and Conor Sheary his sixth in the first five minutes of the second period to start the comeback. Tom Kuhnhackl and Nick Bonino added short-handed goals scored 24 seconds apart to put the Penguins in front through two periods. It was the first time Pittsburgh scored two short-handed goals in the same game since February, 2012 and the first on the same penalty since Oct. 27, 2010. The Sabres regrouped and tied the game with a power-play goal early in the third period. Zach Bogosian took a back-door pass from Johan Larsson and roofed a shot behind Murray, allowing the Sabres to force overtime. “I liked the way our team came back,” said Sabres coach Dan Bylsma, who won a franchise-record 252 games and won a Stanley Cup in Pittsburgh. Pittsburgh experienced little trouble recently with playoff contenders Detroit, Philadelphia, the New York Rangers and NHL-best Washington Capitals. But the Penguins looked listless at times during losses against New Jersey and Calgary and trailed early against Carolina, all teams that will miss the post-season. It happened again on Tuesday when Matt Moulson scored his sixth, O’Reilly his 18th and Jake McCabe netted his fourth, allowing Buffalo a 3-0 lead through one period. Moulson opened the scoring with a power-play goal midway through the first period. He backhanded a loose rebound from Larsson’s point shot behind Murray. The Sabres took advantage of Pittsburgh’s power play struggles with a short-handed goal later in the period. Pittsburgh is 4-for-32 on the power play during the most recent stretch without Evgeni Malkin and couldn’t generate much through two chances before the Sabres scored again. Following a turnover at the blueline, David Legwand’s initial shot squeezed through Murray’s pads during a 2-on-1. Trevor Daley nearly saved the puck from crossing the line, but O’Reilly slammed home the rebound for the two-goal lead. The Sabres extended it to a 3-0 advantage six seconds into a late four-on-four. McCabe snuck behind the defense after a faceoff and received a cross-ice pass from O’Reilly, going forehand-to-backhand to beat a sprawled Murray. Lovejoy put the Penguins on the board 1:28 into the second period, taking a feed from Bryan Rust and sneak a bad-angle shot underneath Johnson’s arm. Sheary made it a one-goal game less than five minutes later when he flipped a shot over Johnson’s shoulder from the top of the crease. Pittsburgh jumped in front, scoring a pair of short-handed goals in the final 1:13 of the period. Kuhnhackl finished a one-timer from Matt Cullen, scoring his fourth of the season to tie the game and Bonino took advantage of a Johnson miscue behind the net. 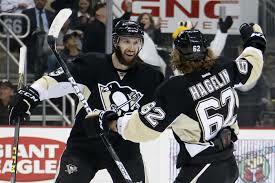 Carl Hagelin forced the turnover and centered to Bonino, who tapped his seventh of the season into an empty net. It gave Pittsburgh the momentum, allowing Letang and Kessel to eventually finish the job in the shootout. NOTES: The Penguins are 35-0-0 when leading through two periods. … Letang played a regular-season career-high 35:14 on Tuesday. …Sidney Crosby finished with an assist and has points in 28 of 31 career games against Buffalo, including 10 straight home games. He has a point in 15 of the last 16 games, registering 23 during that span.